Rincon de la Vieja volcano hiding in the clouds behind Finca La Anita. Last week I spent my vacation in Costa Rica with my wife, Cat, and my daughter, Shelby. In addition to a couple of beach days, we did a number of tours, both adventure and tourist-bus style. 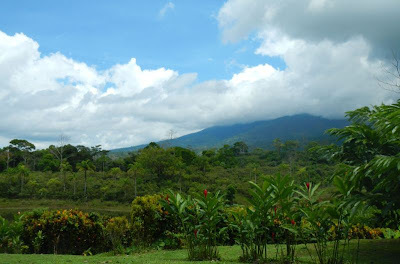 Costa Rica has made a significant investment in eco-tourism. I used to do some weekend adventure guiding in Massachusetts and New Hampshire, teaching beginner rock and ice climbing, year-round backpacking, and basic paddling, so this resonates strongly with me. While we enjoyed all the tours, one that stood out for me was the "Costa Rica's Roots" tour. This was a small group, 4 others besides us, the guide, and the driver. 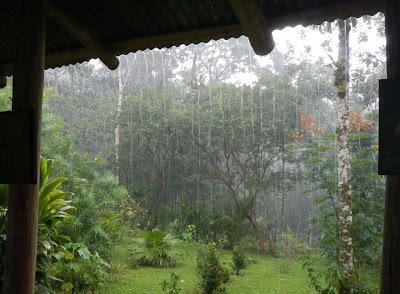 We took a van north to the village of Colonia Libertad in the mountain rain forest surrounding the Rincon de la Vieja volcano, where we stopped at Finca La Anita (Farm of Anita), owned by Pablo Cespedes Trejos and his wife Anita. The last 10 miles or so was on gravel road. Finca La Anita instantly connected with me on a number of levels. It's a beautiful place, the heat moderated by the forest and the slight elevation. Pablo is a graduate of EARTH University, whose mission is sustainable development, and he has taken on that mission to develop an organic, sustainable farm as an alternative to destructive high-impact methods. He's very engaging and intelligent, constantly experimenting to improve the economic yield of his farm while reducing its environmental impact, at the same time helping provide for the local community. In addition to a 700-acre farm, Finca La Anita serves as an educational center and base camp for those wishing to learn about the rain forest, with 10 cabins for visitors. I loved the messages of self-sufficiency, preservation, education, and intellectual exploration. 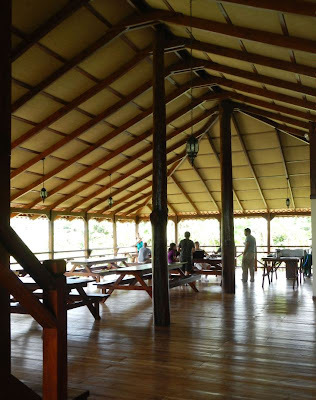 The tour started in the visitor center/dining pavilion, an open-air structure designed by Pablo and built with local woods harvested from the farm and another nearby property. Of course, "local wood" here means beautiful tropical hardwoods that would be exorbitantly expensive in the US. Cat enjoys the open-air lounge in the visitor center. Look at all that beautiful tropical wood! Note that timber use is a sensitive subject in Costa Rica due to the destruction of the rainforest. Everywhere I saw wood crafts for sale, there were signs indicating that the wood came from natural fallen timber and debris. Efforts are under way on a number of fronts to develop more sustainable methods of managing forest resources, obtaining economic benefits while preserving the forests. This reminds me of the messages of the books Harvesting Urban Timber: A Guide to Making Better Use of Urban Trees and Coppice Agroforestry. Pablo showed us how to make a simple heart of palm ceviche (see the video below). Heart of palm is literally the core of a 7-month-old palm plant farmed for that purpose. It has a delightful mild taste and texture, slightly nutty with a bit of crunch. With the palm spread in a 9x13 dish, spread the lime juice and olive oil over it. Add the onion, bell pepper, tomato, and cilantro. Drizzle on the lizano sauce. Mix loosely with a spoon, cover and refrigerate for an hour or so to marinate. 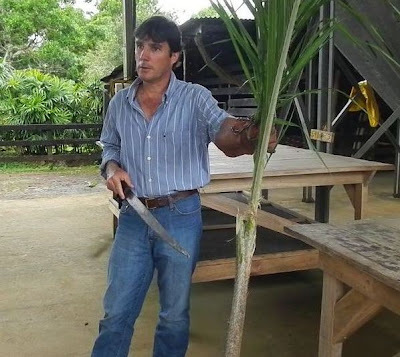 We went over to one of the farm buildings and Pablo showed us a freshly cut palm plant, about 12 feet tall. Wearing a heavy leather glove with chains along its length as blade guards, he used the ever-present machete to cut off the bottom stalk. This is the edible part, the rest is compost. The outer sheath is also waste, composed of layers of long leaf beds, with tiny sharp spines that he said indigenous people used to use for blowdart tips. He split this sheath and pulled the edible heart from within. Pablo shows us a palm ready for processing. This 12-foot plant will yield one stalk about 2 feet long. In addition to the ceviche, salad, and meat main dish, the menu included ginger lemonade. For those who like ginger, this is an awesome fruit drink. It starts with normal lemonade. Then you strain sliced fresh ginger root with boiling water to extract the flavor; add this water to the lemonade and chill. The strong ginger gives the flavor quite a kick. We then toured part of the farm riding in a tractor-pulled cart. 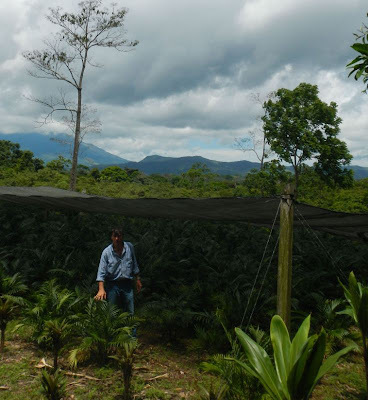 Pablo showed us various experimental and production planting areas. His main goal is to produce economically viable crops using a minimum of labor and a minimum of fertilizers (organic only), maximizing benefit at minimum cost. This requires a mixed strategy of spacing, mixed plantings that complement each other in some way (for instance, for pest control), and soil management. The volcanic soil in this area is fairly acidic. Pablo explains the management strategy for mixing plants and filtering the light. Sprigs from these small decorative palms are used by florists all over the world. Closeup of the mixed plantings. One of the more fascinating things he explained to us was the effect of the bromeliads growing on the forest and orchard trees. These are epiphytes, non-parasitic plants that grow on other plants and capture rainwater. Micro-organisms living in this collected water exhale vapor as a biological waste product. Amazingly, he said this vapor accounts for 30% of the world's cloud production. 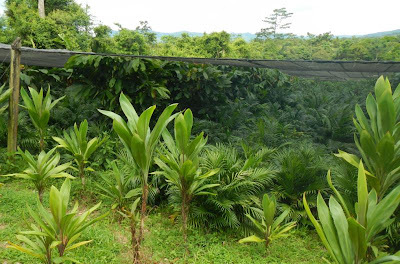 From such tiny processes in the rainforest emerge global effects. One of the many reasons why rainforest protection and preservation are vital. We returned to the dining pavilion for lunch. The ceviche was delicious, as was the lemonade and the Central American beef. After lunch we bade Pablo adios and went into the village. 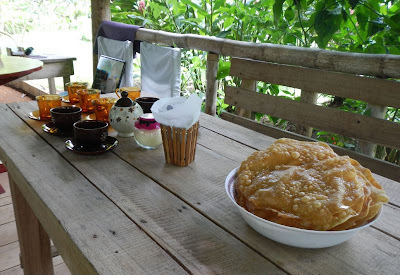 The next stop was at the home of Araselis, a lady who made us traditional prestinos, a kind of fried pastry, and Costa Rican coffee. The prestinos are the thinnest crust imaginable, covered in sugar cane syrup. Her house is a typical rural style, a small wooden building with a few rooms. 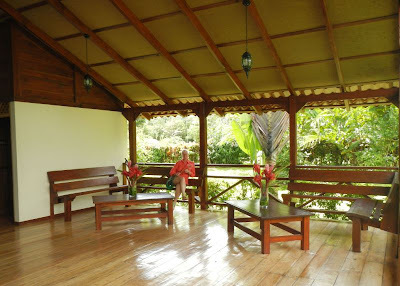 In the back is a beautiful tropical garden with a covered picnic area (one guide told us that Costa Ricans judge their homes by the beauty of their gardens). We ate out here, meeting her husband and daughter, and playing with the family's puppy and parrot. 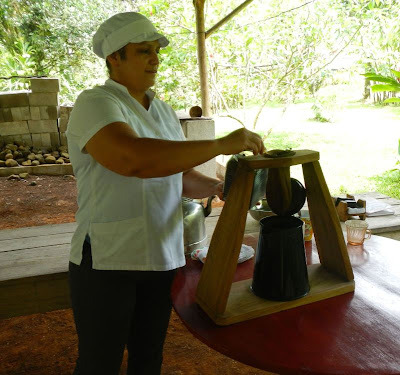 Araselis making coffee Costa Rican style. She fills the cloth filter bag with ground coffee, then pours boiling water through. A bowl of prestinos ready to serve. 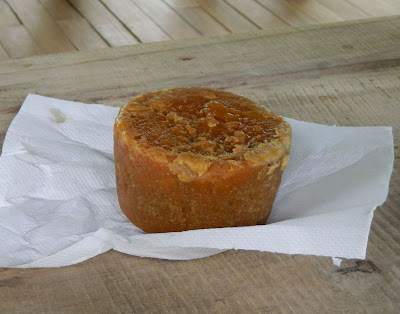 A molded cone of tapa de dulce, made from sugar cane juice, similar to New England maple sugar candy. Some of this is scraped off and dissolved in hot water to make thick agua dulce, syrup for drizzling over the prestinos. This is the rain forest, and June is the rainy season. It poured for about 10 minutes, then cleared up. This tour, as well as the others we did (half-day ATVing, visit to Nicaragua, "Pure Adrenaline" whitewater tubing and zip-lining, and visit to Arenal Volcano region) and our overall travel arrangements, were all through Swiss Travel Costa Rica. They did an excellent job, and were very well-organized. Their guides were very capable and experienced, exceptionally knowledgeable in all kinds of topics including biology, geology, geography, history, politics, and economics. Their drivers were also excellent, a point I really appreciated when we went through the Nicaragua border crossings (picture one lane in each direction, with about a billion 18-wheeler trucks lined up waiting to get through). Everyone we met was friendly. The Costa Ricans are justifiably proud of their achievements. While not all of their social ideas would be uniformly popular in the US, they get all of their electricity from renewable sources, 12 years of education is mandatory, all education including university level is free, health care is free (paid for through income taxes), there's no government-provided welfare, and literacy is over 95%. All able-bodied citizens are expected to learn how to make a living, and then work to earn their way. Education is paid for by not having a military, though that makes them dependent on the protection of the UN and the US. While tourism has overtaken agriculture as their main source of employment, surprisingly, high-tech chip production has become their main source of income. They're very protective of their natural resources. 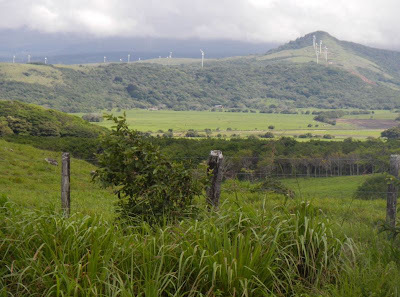 Costa Rica derives all of its electricity from renewable sources. Here's one major source, a line of windmills on a ridge. Hydro is first, followed by geothermal (this is a land of active volcanos), wind, then solar. If they ever switch over to electric vehicles, the entire country could be renewable-powered. Finally, when I had told Pablo that I do woodworking with hand tools, and sometimes use green fallen wood, he said we should stop at Tony Jimenez' gallery on the way back. The guide was kind enough to have the driver make a quick stop. I didn't get to meet Tony, but I got to admire a number of his pieces. 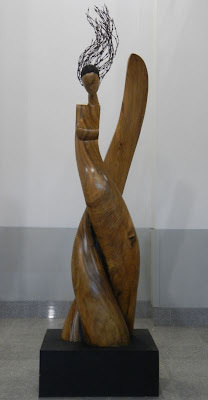 He uses waste tropical wood for his sculptures, starting with chainsaws and progressing with finer tools to smooth, organic forms, some quite large. He often mixes in metal parts, such as bicycle chains and bits of barbed wire fencing. I recognized his work as one of the pieces at our hotel. There was another at the airport. Tony Jimenez' 10-foot-tall sculpture "Lily" at the Daniel Oduber International Airport.